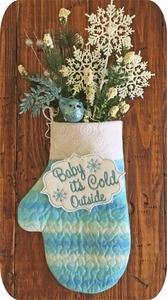 A fun twist on traditional holiday stockings. You can display these all winter. Our mitten stockings are made completely 'in your hoop'. They're made in just one hooping. 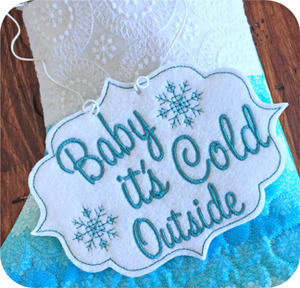 We've also included the 'Baby It's Cold Outside' sign in 4x4 & 5x7 sizes. We used our Texture Magic on the cuff on one of our samples. It makes the mitten look really special, but it's not necessary to complete them. Instructions for using Texture Magic are included. You can monogram the cuff or the mitten. The instructions tell you when. 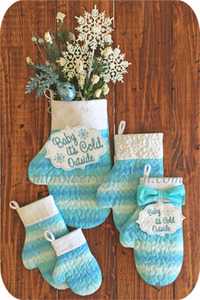 These are stockings and decorative items. They're not intended or designed to be worn on your hand. Fill with greenery and display them all winter.